Eliminate any pathogens still present. Only once reached these goals you can proceed to storage the waste in landfills or to reuse it in agriculture. The sludge resulting from the water purification process, should be treated as it is not yet hygienic, smells strongly, and is cumbersome. The design of a sludge treatment plant should than consider at this point of the process a cleaner down the sludge treatment line aimed to solve these problems. The fat component derived from the oil separator, the primary sludge of primary tank and excess sludge resulting from the final sedimentation tank, are collected in the wells of pre-thickening where the scrapers thicken the mud, and the supernatants are aspirated and pushed to the primary treatment. Hoppers then sieve the pre-thickened sludge because it might still contain the coarse waste material not filtered by the mechanical treatment, which, after having undergone compression, is disposed with the material collected from the grids. The finer part of the slime, undergoes a further mechanical thickening by means of flocculating substances and special machines, where further water is removed, and the result is a substance that quadruples its dry component per liter: also in this case the extracted water is replaced in the purification process. Biologically, ie for digestion that can be aerobic or anaerobic. The aerobic one completes a process started in the aeration tank, and consists in injecting oxygen into the vessel where is contained the slime to homogenize the substance and impregnate it with gas. The supernatant is then picked up and sent back to the oxidation tank. As for the anaerobic digestion instead, you must exploit the organic component of the sludge to produce biogas and subsequently electricity and heat (see the appropriate section for further focuses). This method is more optimizing, since almost all the carbon entered as biomass in the process is converted into biogas and only a small part remains in the waste biomass. The organic component is reduced by 40-50% during about 30 days of permanence in the tanks, and the result is a solid stable substance. From this process is achieved power, that is partly used by the plant and partly sold, and heat, which is good to keep constant the biomass temperature as well as to heat houses and offices. Chemically, or using special chemicals. These processes, lead to a considerable reduction of solids remained in suspension in the mud. The digested sludge is sent to the appropriate static thickeners, which extract additional water from the slime and send it to the treatment plant, since still rich in ammonium. 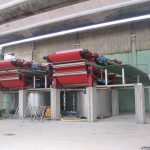 The mud further dried by the static thickener is even further dried through centrifugation to bring the dry component percentage at about 24 percent, and reducing ten times its volume. The obtained water is again pumped into the purification plant, and dried slime is stored in silos, from where they will be loaded onto trucks and headed toward the final disposal, closing a significant sewage waste management cycle, a great help to the environment and all its inhabitants.